Finding Sunday school activities about Old Testament stories such as David and Saul has never been easier! Children's Worship Bulletins have done the hard work for you. We have created an entire library of bulletins for nearly every story in the Bible, making it easy to offer engaging Sunday school activities for your class. 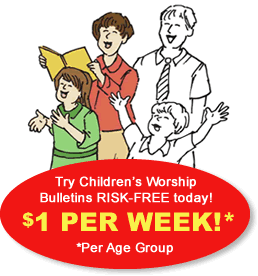 Children's Worship Bulletins includes bulletins for two groups — ages 3-6 and ages 7-12. The bulletins are biblically based and scripturally sound. Each activity helps children learn Scripture, not doctrine, making them appropriate for a variety of Sunday school classrooms. We think you'll love Children's Worship Bulletins. We've included two examples of activities created from our bulletins about David and Saul in this short article. Sunday school activity about David and Saul for ages 3-6: David did not kill Saul. Distribute a bulletin page to each child. Explain the object of the game, "The goal is to capture Saul's flag without getting tagged 'out.' Saul's team will guard the flag while David's team will try to capture it. If someone from David's team captures the flag, David's team wins. If all of David's team is tagged out, Saul's team wins. Members of Saul's team must stay at least 5' away from the flag but are allowed to chase members of David's team to tag them." Divide the children into two teams. Designate one David's team and the other Saul's team. Show each team where the flag is and where the 5' boundary is. Yell, "GO!" and wait for David's team to capture the flag or to be tagged out. Give each member of the winning team a small prize. Read aloud 1 Samuel 26:1-25 to reinforce the lesson. Sunday school activity about David and Saul for ages 7-12: Then what happened? Distribute the pencils and a bulletin to each child. Explain the object of the game, "The goal is to be the first person to find all of the words in the 'Then what happened?' word search puzzle."